Most everyone understand the importance of taking regular exercise - be that walking the dog, going on a bike ride, running a half marathon or engaging in an iron man triathlonHowever very few people understand that 75% of any successful exercise regime of any sort has to go hand-in-hand with eating the right food to fuel the training or exercise. In the exact same way as they need to wear the right clothes and shoes to undertake the exercise. To make it all even simpler all the recipes directly integrate with the award winning App MyFitnessPal. So tracking calories, carbs or whatever, could not be any easier. Most people think cooking the right fresh food would be a very time-consuming, complicated and limiting experience. They could not be more wrong or further away from the truth. Cooking for Fitness is a beautifully crafted and illustrated book containing some 79 unique and bespoke recipes, complied in very understandable, straightforward terms, exactly how simple it is to easily learn how to fuel your training the smart way. Boost your performance and achieve your body goals, with the results you want, be that fat loss, muscle gain or whatever goals you are seeking. All put together based on the minimum preparation and cooking time. 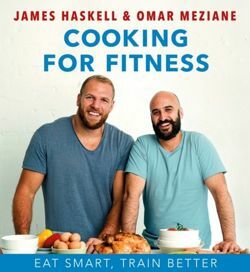 Limited ingredients, all of which would normally be found in everyone kitchen cupboard but above all unbelievably varied and tasty food by rugby superstar and bestselling author James Haskell and his pal, one of the UK's top performance chefs and current England football chef, Omar Meziane. Unlike the majority of new wave healthy eating books, this book features honest, uncomplicated real food using everyday ingredients. The book contains 79 original recipes packed with delicious, satisfying meals for hungry, active people. James Haskell is an elite athlete who demonstrably knows how to train his body and fuel it in the right way, resulting in his impressive physique and sporting achievements. Omar Meziane is a high-performance chef who masterminds the meals for England's top footballers and the Great Britain Olympic rowing teams to ensure they perform at their peak. Now together they are sharing this unique and preciousknowledge with anyone who wants to cook and eat to get fitter and healthier. Whats in the book? * Clear, authoritative advice from James and Omar, the `Cooking for Fitness' dream team. * 79 everyday easy recipes to fuel your training. * Learn how the right nutrition can improve your performance. * Low-carb and high-carb meals with full nutritional breakdown. * Easy to read and easy to use. * Seamless barcode link with the best selling MyFitnessPal App. * The theme of Cooking for Fitness is to promote understanding that 75% of any successful training regime is down to diet and the food you eat, to fuel your body to train. * The book shows how quick, simple and easy it is to eat really healthily, effectively and well. * James and Omar's book is about cooking well, cheaply and quickly with the maximum of enjoyment and success.